Despite summer technically coming to an end, the temperatures here in the Bay Area are showing no signs of dropping (last night’s thunder storm aside). It’s no surprise, as Bay Area residents have long known that it isn’t “June Gloom” or “Fogust”, but rather September and October that are our nicest months of the year. This is why I chose to get married in early October (where it proceeded to be 100 degrees), and why I’ve resurrected my shaved ice machine, aka the Blue Beast, from the crawl space under the house. For this week’s shaved ice recipe, I hearkened back to my boozy roots. I’ve always been fascinated with bananas foster – maybe it’s the pyro in me, or perhaps it’s all that rum that fascinates me. Honestly, it really is a wonderful flavor combination. 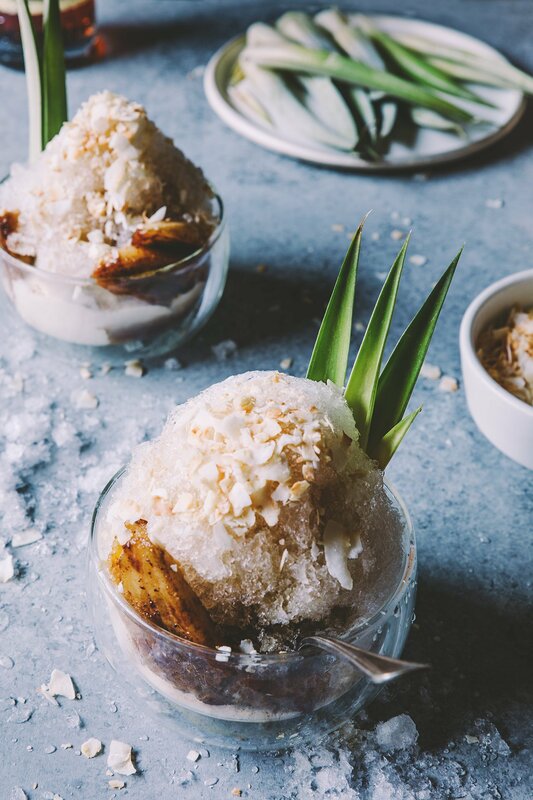 Sure, it’s a bit dated, but when served drizzled atop a heaping mound of freshly shaved ice, and a couple scoops of coconut ice cream, this old school dessert is my new favorite way to beat those soaring temps! Caramelized banana and rum syrup drizzled atop a heaping mound of freshly shaved ice, and a couple scoops of coconut ice cream. This old school dessert is my new favorite way to beat those soaring temps! Add butter and sugar together in a medium frying pan and melt over medium heat. Add the banana pieces and continue to cook over medium heat until lightly browned, turning once. Remove the pan from the heat, and add the rum. Carefully use a long-reach lighter to light the sauce. Be sure to stay a safe distance from the pay when you do this, as it will create a very high flames! Carefully spoon the sauce over the bananas until the flames go out. Remove the bananas from the pan, and set aside. Pour the remaining sauce into a container, and set aside while you build your shaved ice. Add coconut ice cream to the bottom of a bowl. Top with a heap of shaved ice. Add the banana slices, circling them around the edge of the bowl, then add another heap of shaved ice to the center of the bowl. Pack/sculpt the ice with your hands, trying not to squash the bananas. Add more ice until you create a mound atop the bowl. 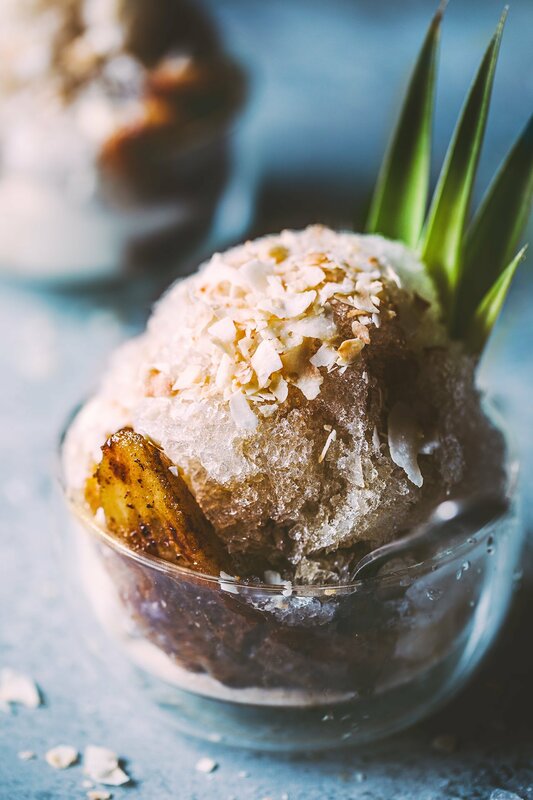 Drizzle the bananas foster syrup over the shaved ice to saturate. Top with a handful of toasted coconut flakes. Serve with spoon and straw. I found it was a better experience to build the shaved ice while the bananas foster syrup was still warm. The mixing of temperatures makes for that hot fudge sundae type of feel. Well this is kind of a genius idea! I LOVE bananas foster so this has my name written ALL over it! Seriously genius recipe! The wizard strikes again with utmost creativity and top notch execution. Way to go Todd Wagner!